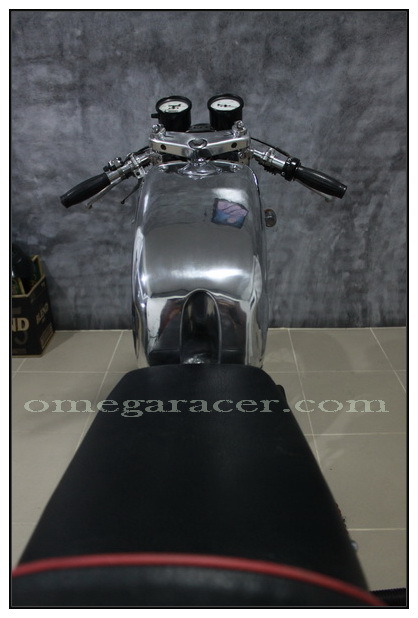 Yamaha SR Aluminium Tank - "Telos"
Aluminium tank for Yamaha SR400, SR500 - "Telos"
The tank is made in Thailand by one of our suppliers and is made to order. This means that the tank will be ready for shipment after about 2 to 3 weeks from the time of your order. All our tanks have been pressure-tested with about 3bar and are carefully packed to withstand international transit. The tank fits all Yamaha SR400 (up to 2010) and SR500. The tank cap and a petcock are included with the tank. Being about 5cm longer than the original, this tank requires a shorter seat.